I know its a bit OT, but its interesting that there has been no discussion on the classical old world indicators:- the states of the North West and North East Passages. Cryosphere (accepting its rough resolution) suggests both passages are either open or soon will be. Its an interesting indicator of our attitudes if these events have now become so commonplace as to be unworthy of note by the scientific community! The North-East passage has been a regular shipping route for Russian shipping for decades. It is not regarded as a closed channel by any means. I’d like to second Nigel’s comment. The thread on the Arctic seems to have gone dead, but I and many others watch what is happening there almost every day and would like to hear what the professionals are thinking about he situation. By the way, jo, I got what you meant right away by different ‘colors’ and I found it an interesting concept. Do the different wavelengths CO2 emits all fall into a spectrum where they can get reabsorbed (probably the wrong word) by CO2 molecules again? Appendix 9.C is not found at that IPCC web site that shows the graphs. How closely are we supposed to look at those graphs? I mean, graph a shows a little red at the Arctic Ocean, I guess because of ice having melted or because of soot particles. Graph c shows a lot of red in the low latitude I think it’s the troposphere. C is more important in the composite. Figure 9.2 analyzes heating from fossil fuel black carbon and organic matter. Are we supposed to examine the shapes carefully or just look at the overall picture? Thanks to the other posters as well as to Rasmus. You’re right about IR and ultraviolet. I was wondering whether over time creatures that had evolved to use the visible range resulted in brains developing differently. To be honest we are only discussing this because we have one biased perspective (we use the visual range) which through a lot of events that happened over millions of years has resulted in us being here. I wonder if there are any studies that look at the advantages/disadvantages of being able to ‘see’ different bandwidths in the context of environment and evolution? Another thing to consider is the range of energies/frequencies involved. It is unlikely that the ability to see would evolve at energies/frequencies that are to high or to low. If we could see high energy electromagnetic radiation we would be bathed in particles that would damage our material structure. If the energies/frequencies were to low, then they wouldn’t interact much with the materials around us. 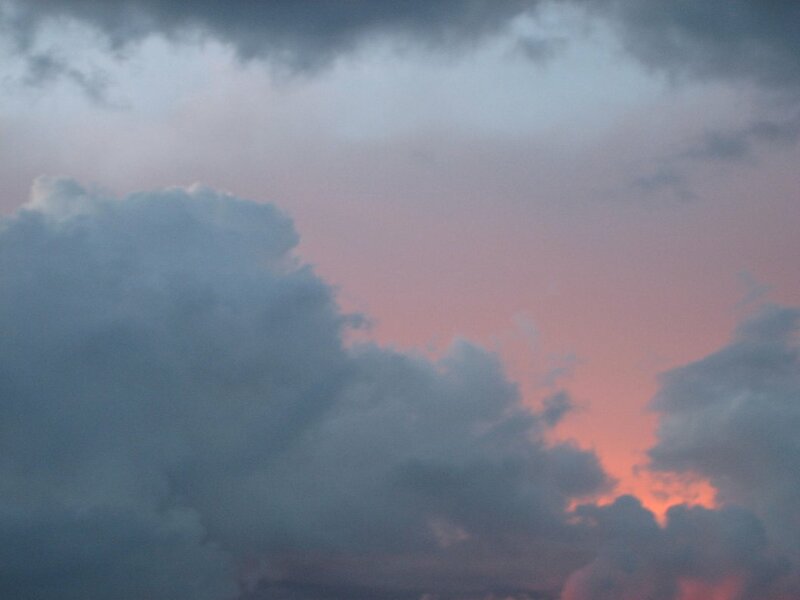 So to high, and we would be damaged, to low and we wouldn’t obtain much info about the world around us. Hank, I think you have some misperceptions about colors and vision. Both sunlight and moonlight have roughly the same spectrum. Moonlight is not blue, we only percieve it to be so. Mainly at low light levels we see in black and white, the retina has rods and cones. The cones have three different color reception cells, the rods are more monochromatic. At low light levels we primarily see with the rods. So nighttime we see mostly black and white with some hints of color. The relected/refracted skylight contains all colors, although the shorter wavelengths are more susceptible to scattering. In the old days of photography, black and white film plus color filters were used a lot. Using a red filter, the sky, and shadows are relatively darker, but not completely black. I suspect the reason infrared vision is rare, is because it is hard to build good receptors. Visible light photons have energies near 1EV, which is roughly what chemical reactions require. So it is easier for the absorption of a photon to create a signal. Adding IR would be really useful. Pit vipers can detect thermal radiation, but the angular resolution is very poor. And if you think about the camera products available on the market, visual and near infrared cameras are very cheap -some for maybe $110. Thermal infrared cameras start at roughly $4000. My comment was not about use of the word colour.It is possible to defend your phrase as being strictly true (the emitted one is not the same photon) but if it had been replaced by its opposite i.e. ‘almost always in the same colour’ it would be less easily misunderstood. I was concerned that your phrase might reinforce the common error that CO2 emits like a black body. Instead you could add that good absorbers are good emitters at the same wavelength as emphasised by the older Angstrom,Rayleigh (for sound) and Kirchoff. As for the other point, you can omit CO2-O2 ,CO2-N2 collisions in an elementary account but not without a loss of accuracy and not satisfactorily if you are including the warming of the troposphere i.e. the O2 and N2. Also your account describes stimulated emission by EM. That is a mechanism, is it the dominant one? Re 54 wili – yes; and in particular, at LTE (which is a good approximation for the vast majority of the atmosphere and Earth), at a given frequency (and whereever important, polarization), a substance can emit (relative to the Planck function) to the same extent that it can absorb (a fraction of incident radiation). My italics. Why more? Wavelength information requires two or more weighted averages over the spectrum. A single type of receptor provides only one such average which is sufficient to estimate the luminance and nothing else. Think of TV or photography. But Edwin Land once reported an experiment in dim light in which various hues were perceived. I think he was trying to demonstrate a novel kind of two colour vision using rods and the most sensitive type of cone. This was not to be confused with his more famous two colour projections. Re color vision – a lot of animals besides mammals have tetrachromatic vision; many mammals only have two different cones. Trichromatic vision helps identify some types of food. I’ve heard that there are two different types of red cones in humans and some have both – does this mean they have a slight amount of tetrachromatic vision? IR vision could allow organisms to see humidity. On circulation patterns: This may be a subtle point relative to the other changes, but changing the concentration of greenhouse gases could alter the time scale of thermal damping of various fluid mechanical waves ( (intertio-)gravity, Rossby-gravity, Kelvin, Rossby). In the stratosphere, CO2 doesn’t have much spectral overlap with anything else, so over spatial scales long enough for saturation near the center of the band, due to the shape of the band, increasing CO2 wouldn’t have much effect. However, larger-vertical wavenumber waves might be damped more effectively by increasing CO2, and increasing H2O should affect the damping of all waves. So would the thermally-indirect circulation of the stratosphere be affected by this, perhaps being weaker at higher levels because of more rapid attenuation of waves from below? Of course, the quasi-stationary Rossby wave absorbtion in the stratosphere occurs at least in part by nonlinear wave-breaking and I don’t see an obvious way that LW opacity would directly affect that. However, synoptic-scale Rossby waves penetrate up from the tropopause as evanescent waves; whatever wave activity is not absorbed presumably reflects back into the troposphere (I don’t know a lot about how the stratosphere affects baroclinic wave lifecycles except for an as-of yet vague understanding of cyclonic-vs-anticyclonic wave breaking (because I set the reading material aside for awhile, will get back to it) but anyway…); LW opacity might affect the absorption of synoptic-scale wave activity in the stratosphere, though perhaps not much from CO2 but more from H2O feedback ? Clarification: IR vision could allow organisms to see humidity. Of course, for sufficiently small vertical wavenumber and sufficiently large LW optical thickness and sufficient absorption band shapes, an increase in concentration of greenhouse agents could actually slow the rate of radiative thermal damping. Meanwhile, cooling (such as in the stratosphere) would slow the radiative thermal damping (becauses of the nonlinearity of the Planck function with respect to temperature) and warming would do the opposite. Visit these two paragraphs at wikipedia, and if necessary the links there to rods and cones. Basically, the human eye contains two mechanisms which work in parallel, cones which differentiate frequency as you describe (3 frequencies, in fact) to establish color, and rods which are not used in evaluating color, but rather are designed to more effectively provide monochromatic images in low light situations, and areas such as peripheral vision where color and detail are not important so a more economical physiology is of value. The large number of posts attempting to clarify different aspects of global warming is valuable and I hope that somebody has the time and resources to take them on board to improve the overall description and explanation of the phenomenon. But the very existence of this large number points to the likely impossibility of arriving at an explanation that is comprehensible and usable by an intelligent, reasonably well-educated, open-minded non-expert, let alone people who don’t fulfill all these criteria. I doubt that there are many climatologists who can come out with the observed outcomes from mental calculations alone. The basic problem is that there are just too many individual elements (interactions) to be considered to be confident of their combined effect from contemplation alone, no matter how well understood each element is. Many of the posts provide clarification of one or a few of these elements, but ultimately we must rely on computer simulations that iterate the interactions to arrive at the observable result- there is a net energy imbalance that is heating the planet. I think that the afore-mentioned open-minded person would be comfortable with expert assertions regarding the net outcome, provided that he/she can get a good explanation of each element from the experts when they ask. Its the same way that we gain confidence in any professional- we observe the overall outcome, but quiz the professional on the particulars to test their competence and confidence. As to people who don’t pass the open-mindedness test- no amount of reason will work- it will just antagonise them further. The best we can hope for is to treat them like the “laggards” on any knowledge diffusion curve (http://en.wikipedia.org/wiki/Diffusion_of_innovations)- they are valuable in that they constantly put the experts to the test, but ultimately they are kept in check by pressure from the “early and late majority” groups, not the “innovators” and “early adopters”- ie the “experts” and “professionals”. So RC participants- keep working on your explanations and make them publically available- but focus your “selling” efforts on the “early majority” people and let the inexorable forces of the knowledge diffusion curve take care of the rest. Otherwise you’ll be driven mad by people who are not amenable to being convinced by you- you are poles apart. We’ve had a recent paper (i don’t have the ref, but I bet most here have heard about it) about the startlingly large reduction in observed ocean chlorophyll. Could this feedback into climate change? IIRC the chemical DMSO is a very important condensation nucleation agent, and it comes primarily from phytoplankton. So might be bet setting off a potentially dangerous, but so far un-modeled feedback? Hello just wondering if the overall windspeed of the jetstream has increased with the extension of the cells. Also since this is an extremely warm year does that effect the amplitude of longwave pattern withe deeper troughs and stronger ridges. While the details are wondrously complex and entertaining hobbies for amateurs, and challenging and deathly important real work for professionals, it’s really not that complicated. Statements 1 and 2 are incontrovertible. Statements 3 and 4 are supported by multiple lines of evidence, and while one can try to nit pick any of them individually (as deniers do), the body of evidence is solid. Statements 5 and 6 proceed inevitably from 4. This is only complex because certain personalities and entities conspire to confuse the issue by casting doubt with singular statements of wishful or purposely wrong thinking (“The expected warming isn’t happening”, “The warming is real but is caused by land use”, “The GHG effect isn’t real”, “Clouds will provide a negative feedback before the warming gets dangerous”, etc., etc.). We can argue about the obfuscations, and thus concentrate on intricate details, but the facts behind these statements are all really pretty straightforward. The logic and science behind statements 1 through 3 are really not that complex. They only become complex when a contrarian tries to introduce a confusing argument, which then requires more detailed explanation, which only leads to the introduction of more confusing arguments. I know I’m saying this after two RC posts explicitly trying to produce simple explanations because of “comprehension issues,” but any perceived failure is in the explanations, not the facts. The facts are only complicated because one side of the debate would like it to seem that way, and works to produce the necessary confusion. I don’t think that we are actually in disagreement. I’ve been lecturing in solar energy for almost 40 years and I’ve found that most people accept the notion of the “greenhouse effect” in greenhouses, houses, solar ovens and cars, due to the different transmissivity of glass in the visual and IR bands (noting of course that most real greenhouses are made of plastic and don’t actually display the greenhouse effect). They can accept my explanations because they directly relate to their own experiences (although most people think that the hot interior is mainly due to the car’s colour, not the large windows)and the physical and visual obviousness of the glass also provides credibility to my assertions. However, these are rather one-dimensional examples. It is a different matter when I point out that actually predicting the thermal performance of a building (ie its temperature vs time over days and months)requires lots of factors to be considered (R-values of walls, ceilings, floors,thermal mass, air infiltration, distribution via convection etc etc). These factors add to, subtract from and delay thermal performance. Although rules of thumb methods can get good ball-park performances for houses, computer simulations, such as TRNSYS are required to get accurate outcomes. We say that solar housing design is simple, but its subtle- each element is fairly easy to explain, but their combination can be difficult and produce surprising effects. The point that I was trying to make is that AGW is like trying to make an accurate prediction of a building’s thermal performance. But in this case we are dealing with a very large building (planet Earth), the “glass” is an invisible gas and the net changes are very small- about 1-2 degrees over a century. The AGW nay-sayers can therefore plausibly argue that good old planet Earth can absorb and buffer such apparently minute changes. In the same way that we can explain the basic physics of collection, storage, distribution and control of energy in a building, we can do the same for AGW. And we can come up with rule-of-thumb predictions and explanations for both. But we have to rely on computers for accuracy in both cases. The fact that we can empirically validate a building’s thermal performance gives me confidence in TRNSYS and by extension, I am confident that the climatologists programs are pretty good. But if I were a knowledge-diffusion “laggard”, or even worse, a knowledge-diffusion “luddite” (as I call the far-right-of-graph tailenders in my lectures on innovation dynamics), I only have to say that I don’t trust computers (because they are perverting our kids),and the credibility of the argument counts for nought. Thus, I say, ignore the “laggards” and “luddites” and concentrate on clarifying explanations as far as possible for the “lead-users”- teachers, businesspeople and the like. John Baker’s post (69) illustrates precisely what you may be overlooking. The science of GHE is not complete enough to provide a basis for the engineering and the physical calculations that we need to be able to do. The extensions and connections of GHE science to Climate Change are even less complete. In fact, it is the details of the incomplete pieces that provide “…wondrously complex and entertaining hobbies for amateurs…” (like me) as well as the real (tough) scientific work yet to be done by professional climatologists. It would seem that your six points are not at all as evident as you would claim. While most skeptics and warmers would probably agree that “GHGs hinder the escape of energy (through IR) from the planet”, quantification such as how much, where, and when require more knowledge of the “details” than we yet have in climate science (think radiative- convective energy balance). That said, your statement #1 is probably OK, but certainly not incontrovertible. It is probably true that, while we are releasing various amounts of many GHG into earth’s atmosphere, to claim in #2 – even for CO2 – that it is “too much” implies the existence of quantitative science details that have yet to be determined (think oceans). I certainly don’t want try to make a case for pollution, I am just pointing out that, for effective mitigation, we need solid quantification of more of the details. Were I to continue in this same vein, I would suggest that “mostly” in your #3 is unquantified, as is “heats” in your #4 (think “natural”). I would agree with your statements #5 and #6, but point out that they were equally true in the past. Any paleoclimatologist would so testify..
You have both omitted the important evidence from the ice cores which leads to a rough estimate of 3 degs.C for 2 XCO2. But that argument needs to be presented properly, not over-simplified a la Al Gore. (Try RC and also Richard Alley’s recent lecture). As for #68 , I am concerned about too much use of the weak analogy to a glass greenhouse. That was exploited heavily by Gerlich and Treuschner’s outrageous huge paper which is still being echoed as a talking point e.g. by the Spectator. I enjoyed reading your posts and I think you make good points. The issue really is that once a mind is made up, it usually stays that way. RC provides the basic general idea of AGW and how we know along with more complex and detailed information as well. Tamino does very complex stuff at times and very easy to understand stuff for the layperson. There are others but those are just 2 that do a great job. Personally I am a big fan of Eli Rabbett. I rarely post there but his posts are outstanding for all sorts of people. You say: “I am concerned about too much use of the weak analogy to a glass greenhouse”. Weak analogy? I can’t see that it’s anything other than a strong analogy. My mention of plastic greenhouses was perhaps an amusing distraction, although the fact that plastic greenhouses “work” throws light on the presence of other heat transfer mechanisms (particularly convection suppression) and is therefore a useful teaching tool. The primary mechanism of CO2 of absorbing (unidirectional)radiation from the earth and (isotropically)re-radiating it is identical to glass- although many people understandably think that glass acts as some kind of mirror. It is more than an analogy- it is another example of the same physical phenomenon. Both greenhouses and the earth have complex heat transfer systems and the critical questions revolve around the relative importance of each mechanism. Jacob Mack (71)- You say “The issue really is that once a mind is made up, it usually stays that way.” The notion of a “mind being made up” is very interesting. Obviously we need to make decisions based on the balance of probabilities of the evidence at that moment, but that doesn’t mean that we have to hold that “belief” if the balance changes at a later date. Of course people would like a high degree of constancy in their environment, but the basic notion of modern education is that of developing a set of intellectual tools to assess data and balance probabilities, rather than repeat medieval rote. My reference to the knowledge diffusion curve with its categories of “early adopters”, “early and late majorities”, “laggards” and “luddites” recognises that people have different propensities to hold to beliefs in different circumstances, although being in one category in one situation doesn’t always mean that they will be in that category in all situations. We shouldn’t sell people short by assuming that they have all been irretrievably indoctrinated on all matters by the age of seven. It seems not very likely that principal global circulation patterns (Hadley Cell, Walker Cell, jet stream) will change completely due to global warming. Probably the most important factor which determines these general pattern is the rotation speed of the Earth (coriolis force), and this one will not change due to GW. However, the factor which induces the whole circulation, the temperature difference between pole and equator, will likely change considerably. This will probably not affect the existance of these principal patterns, but might change their intensity and extension. One of the most consistent expectations is the northward extension of the Hadley cell combined with the poleward shift of the jet stream and a poleward extension of the subtropics. This is expressed in a consistent drying of the regions at the current poleward border of the subtropics in most climate model projections. This projection is also consistent with what we observe every summer, when the pole-equator gradient strongly decreases. A) orography: while dynamic effects of huge mountain ranges (like the Rocky Mountains which cause on average a wave ridge over it, leading to a much warmer climate in California than at the US east coast at similar latitudes) are unlikely to change, the effects of heating and cooling of plateaus (e.g. Tibet) might be altered. C) pole-equator temperature difference: This difference has also an influence on the shape of the polar front (e.g. the extension of polar front waves, the production of cut-off lows and highs). 1) Waves with larger amplitudes and strong meridional (north-south directed) flow as well as cut-off lows transport more energy equatorwards and are more effective in offsetting the temperature gradient than a more zonal (west-east directed) flow with small amplitude waves. Thus, in general the stronger the gradient, the larger are the wave amplitudes. 2) Wave patterns (of the polar frontal zone) have some kind of inertia in their geographical location, i.e. cold air outbreaks (or warm air outbreaks poleward) tend to occur in the same region as the one before. This leads to a certain persistence of weather characteristics in a region for several weeks (outbreak frequency is about one every 6-8 days). It seems plausible that there is need for rather strong dynamical forces in the atmospheric circulation to overcome this quasi-inertia. The strength of dynamical forces is also linked to the strength of the temperature gradient and might somehow influence the probability to change general geographical wave patterns. 1) since continental or orographic heating or cooling supports more stable pressure fields and thus circulation patterns (the circulation in principal flows around pressure centers), warming in winter might tend to destabilize flow patterns over large land masses (siberia, Canada), while warming in summer might tend to stabilize flow patterns over these areas. 2) Global Warming might lead to smaller wave amplitudes and less cold air outbreaks equatorwards, i.e. to the subtropics, which might lead to a further drying there and increase the effect of an extended Hadley cell. 3) Warming might lower dynamical forces and increase the persistence of weather patterns. A big problem is that changes which concern the dynamical behaviour of atmospheric circulation are very difficult to identify (be it in observed or modelled climate), because these patterns are very chaotic and never identical and requires the mathematical capture of the dynamical behaviour of chaotic patterns. Common instruments to describe circulation patterns like Principal Component Analysis or weather type classifications do not contain the required information on dynamical behaviour. One would need a mathematical instrument to calculate e.g. daily amplitudes of rossby (i.e. polar front) waves or measure the duration of the “same” geographical wave pattern somehow – a nasty job. There are some studies which look at the persistence of weather patterns on a local scale (e.g. Petrow et al., Nat. Hazards Earth Syst. Sci. 9: 1409-1423, 2009; Weatherhead et al., Global Env. Change 20: 523-528, 2010) but there seems to be hardly anything in that sense on a hemispheric scale. Any ideas? In summary, there are several reasons to expect a poleward shift of the subtropics (much evidence) and an enhanced persistence of weather situations especially in summer (less evidence, more based on theoretical considerations). The latter would further increase the severity of heat waves and drought (besides the overall warming) as well as of floods (besides the increase of water content in warmer air), since heat- and flood-prone situations might last longer. And here’s where you completely miss my point, and are quite simply wrong. Yes, it is. The science is maturing, but it is complete enough. Delusions that things are too complex, and that there is a lot of room for doubt, are just that, delusions, made to appear real by continually trying to focus on and confuse intricate details. On your part, your use of phrases like “you may be overlooking” and “not at all as evident” and “and warmers would probably agree that” and “is probably true that” and “we need solid quantification of more of the details” all point to typical denialspeak. That’s the whole point. That’s your approach. Cast doubt. Make things seem uncertain. Question the facts and make it seem like they’re mere opinions or ideas. The first two statements I made are completely incontrovertible, period. Anyone that doubts those two is in clear denial. GHGs warm the planet, CO2 is a GHG, we’re pumping out CO2, and the planet is warming. Period. The question of “how much” (since most of the serious warming comes from the feedback of increased H2O in the atmosphere) is the main, reasonable subject of contention, but this is where many, many lines of evidence come into play. Geoff mentions ice cores, and in fact many such proxies over the entire history of the earth, direct observations, computer models, and many other lines of research all point to the same 3C warming per doubling of CO2. So while you can argue about this point or that paper or whatever, there is a large body of evidence that combined puts a scary nail in the planet’s climate coffin. Your convenient doubts are merely a desire to ignore the facts for as long as you can. The clues are all there to be read by anyone who is reasonable. The problem is that certain personalities (like yourself) and entities are enticing people to be unreasonable, making use of the illusion that they are being intelligent and properly skeptical. Hence the need for posts like this by RC. We have the details we need even if we cannot calculate deltaT at equilibrium from the CO2 absorption spectrum from first principles. We know the climate sensitivity. We know how much energy added CO2 adds for a doubling. And these facts are validated by the evidence we see everywhere. The thing you have to remember about science is that there is always more than one way to “know” something. One can sometimes constrain an answer to a narrow range much more quickly than one could calculate it from first principles. And overwhelming evidence is overwhelming evidence. Please forgive me for not making myself more clear. My point is about potential CC mitigation, not about the reality of GW or CC. Regardless of what you may wish to believe, more CC details are a requirement. We need them in order to choose what and how much we can and should do. If you can read the scientific literature and do so, as I have, you will discover that I am simply telling RC readers like yourself what most leading climate scientists already know and report there in their papers. Your posts are a presentation of the political (some would say religious) side of AGW. I am not interested in (or qualified to) add much to such a discussion. FWIW, I believe globally we are very short of resources for our world’s population. With this in mind we must certainly try to adjust our behaviors wrt CC. As one example, I believe we have waited much too long to try to find alternatives for fossil fuels. One result is that developing nations like China, trying to improve the quality of life of their citizens by following centuries old models that developed nations used have little choice but to continue to pollute. All over the world nations are searching for better (more Green) ways to live. We all would be much further along on a great deal of this had we more solid scientific CC quantification. It is not enough to know what should be done, it is necessary to also know how to do it. In climate physics and chemistry, this requires a higher level of scientific quantification than AGW currently provides. Not “denialspeak” about comforting details, it is an absolute requirement for choice for any widespread implementation of each and every CC mitigation attempt. This was a very good overview. Thank you for making TOA cooling/warming make sense to me. This should be a chapter in a short book/PDF on climate change. Outstanding post! Concise, clear, and educational. I vaguely remember reading somewhere (probably Broeker) that during the Dryas(s), the thermohaline pattern might have been “shut off” by fresh water melt from glacier retreats. Do you believe that happened and might even be repeated? JP 70: It is probably true that, while we are releasing various amounts of many GHG into earth’s atmosphere, to claim in #2 – even for CO2 – that it is “too much” implies the existence of quantitative science details that have yet to be determined (think oceans). BPL: Ah, the religion card! Every thinking person hates religion, so if AGW is a religion, it must be fought. In what way is a theory of how the climate is changing a supernatural worldview? Thank you for your time and for your clear comment. ISTM the degree of necessary detail ought to bear some relation to the use made of the results. Kevin was saying more detail is required to correctly account for energy balance. He had lost/misplaced some energy somewhere and believes he needs more detail to find it. You think, I believe, that the data he wants would be very difficult and expensive to acquire – maybe even “impossible”. The GHE absorption/emission calculations and debate are much more difficult for me to understand than radiation energy balances, for me an acceptable alternate explanation for GHE explanations. I am distressed if/when Kevin seems unsure of his accounting. Kevin’s argument for additional details seemed to be based mitigation analysis requirements; that’s the only reason for my focus. That’s my excuse. I do get your message. I’ll consider mitigation analysis OT – until we have a thread that addresses it. 82 – A theory of how the climate is changing is a supernatural worldview when belief overcomes detailed facts in its exposition. Don’t get me wrong, I have nothing against religion or beliefs. It’s just that my religion is physics and while I admit that’s an arbitrary choice on my part, I do not find it at all supernatural. BTW, I continue to find you and your website quite helpful in my quest for knowledge. Thank you. what you are looking for regarding OT topics here on RealClimate. Re 74 Urs Neu – very informative, Thank You! (would love to see more comments/posts of that sort). If the prevailing westerlies changed speed, that could change the spectrum of wavelengths in the quasistationary pattern (which are produced by topography and geographically-anchored heating variations) (because different wavelengths would propagate freely at different westward speeds through the air as the air moves; resonance occurs when the wave propagation velocity + wind velocity = velocity of wave forcing pattern, which is zero in this context.) A latitudinal shift in the winds would alter the geographic forcing of the waves and the planetary vorticity gradient as well as the wavelength for a given zonal wavenumber. As the storm tracks shift poleward, they would encounter a larger coriolis acceleration (favors shorter horizontal scales of circulation structures) and weaker planetary vorticity gradient (slower westward propagation of freely-propagating Rossby waves). They would also encounter a thinner troposphere (favors shorter horizontal scales), although meanwhile the tropopause would generally tend to rise in place (favors larger horizontal scales). If a poleward shift in the specific humidity contours is greater than the poleward shift in the storm tracks, latent heating could become more important in formation of extratropical cyclones. Latent heating is one source of the asymmetry between cyclones and anticyclones. Are there any particular ways in which the changes with global warming would be different from the direction of change from winter to summer? (Besides such things as vegetation and ice sheet responses, which of course must respond to the whole year/decade/etc of climate.) Imagining June weather patterns shifted into May, the ‘June’ weather patterns would encounter less incident solar radiation at TOA/ but shifting July weather patterns into June would have the opposite effect on the ‘July’ weather patterns, for example (in this way of looking at things, the ‘months’ would shift different for continents and oceans because the warmest part of the year is more delayed over the oceans, etc). I’ve always been interested in the sensible heat introduced into the atmosphere by human machines. We have literally billions of automobiles, each directly heating the air and generating convection currents. We have millions of industrial sized air conditioners, heat pumps introducing a gazillion joules directly into the air. Similarly, the cooling towers at the thousands and thousands of power plants generate huge convection currents that I have observed in Winter in Europe pumping moist air tens of thousands of feet into the air. Additionally, the earth itself is a source of heat, caused by the left over heat from planetary formation, the radioactive decay in our core plus the heat generated in the magma from the friction from the gavitational influence of the Sun and Moon. Does anyone ever include these sources in these diagram graphs? Are the amounts of energy known (particularly the earth’s intrinsic energy)? Given that the CO2 we are worried about is released during the generation of all that waste heat, surely the size of that waste heat must be significant? … on that note, poleward shifting of wind patterns should generally result in poleward shifting of the upper ocean currents. The same corresponding portions of gyres would experience reduced planetary vorticity gradients – would that reduce the intensification of the western boundary currents (Kuroshio, Gulf Stream) (following the latitudinal shift)? – of course, there would be also be different ocean basin geometry at different latitudes. (PS generally Rossby wave propagation depends on a potential vorticity gradient, of which, the planetary vorticity gradient is an important contributor; variations in relative vorticity (horizontal shear and curvature of wind field) and static stability, or at the surface, potential temperature, also make contributions. History is full of holes, and so is memory, on occasions. I must admit I find both this statement rather unbelievable, and your unsupported attacks (religious? really? and you claim to have “read the scientific literature”?) more than a little annoying. There is nothing remotely “religious” in my statements, and your attempt to color it as such is nothing more than a predictable (denier) debate tactic. Given the application of the term to atmospheric LW opacity, and the allusion to a glass greenhouse, couldn’t it be said that the greenhouse effect is simply the sustaining of higher temperatures not by increasing heat inflow but by slowing heat outflow? 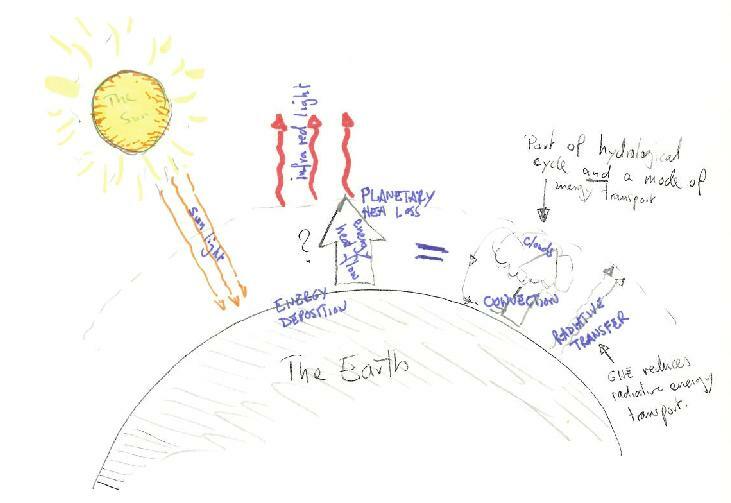 ie – the radiative greenhouse effect of the Earth’s interior is saturated, won’t change much, and thus never discussed. the finite molecular conduction/diffusion greenhouse effect of the atmosphere is essentially saturated except in a thin layer at the surface in some conditions, won’t change much in many scenarios and thus generally set aside. The radiative greenhouse effect of the atmosphere is not saturated and has great potential for changing, thus is the focus of much attention (as it should be). Greenhouse effects: LW opacity in the atmosphere; the impeding of all forms of heat transfer by a winter coat or blanket, etc. Absent convection, all heat transfer is by radiation and molecular/atomic/etc. conduction/diffusion; these things occur at rates determined by temperature variations (or compositional variations for latent heat diffusion – the rest of this sets that distinction aside but since latent heat is generally converted from and to sensible or other heat, the following should tend to apply with inclusion of latent heat for a climatic equilibrium state). Consider a layer, and then consider changes in optical properties, thermodynamic properties, viscosity, etc, in that layer (for the time being, not distinguishing between external forcings and feedbacks), and in other layers, and temperature changes in other layers (or the sun, etc.). These exert some imposed differential heating distribution on the layer. The layer’s temperature and temperature distribution will change until the temperature of the layer and the distribution of temperature variation in that layer reach an equilibrium such that their is a differential cooling distribution within the layer that matches the differential heating distribution. For some set of externally imposed conditions, the average temperature of a layer will shift to some equilibrium and the temperature distribution will shift as well. If convection acts to hold the temperature variations steady, then imposed changes in the heating/cooling of the layer may not result in much change in the relative temperature variation pattern of the layer. On the other hand, the temperature variation pattern may tend to shift in some way. However, for any given temperature variation pattern, the average temperature of a layer and the temperature at each location within the layer must increase or decrease until the total flux into the layer is balanced by the total flux out of the layer, however the sources and sinks are distributed within the layer. PS if we are helping to read text via the ReCAPTCHA system, how does it know whether our answers are correct if they haven’t already been determined? Is it the case that some answers have already been shown likely incorrect (ie 9 or 1) while others have not been eliminated (ie 2, 3, or 4) – ie some uncertainty remains but it is limited? Those fluxes are known, and they are relatively tiny. (The geothermal heat flux is on the order of (actually a bit less than) 0.1 W/m2 in the global average. The energy from work done by tides is an order of magnitude smaller. Total human energy consumption is on the order of 10 TW (a bit more, but less than 20 TW; 10 TW ~= 0.02 W/m2 global average), which is more than twice the tidal energy but still considerably smaller than the global geothermal heat loss. 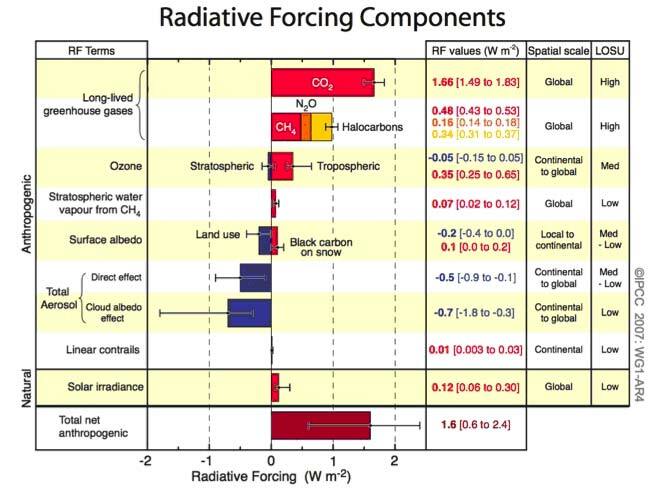 Meanwhile, the forcing from anthropogenic CO2 increase thus far is somewhere around 1.7 W/m2 (http://chriscolose.files.wordpress.com/2010/03/0108_radiative_forcing.jpg , from IPCC). Maybe, but a citation would be welcome, because topography determines a lot; I recall the area cooled by wind descending off Greenland happens to be an area favorable for removal of sinking cold water to the abyss, for example — now, if the jet stream moves, and the cold wind coming down off Greenland moves to a new location, can we rely on that location pushing the same area initiating the same large scale circulation? Or will it produce cold water that has to find some other route to the deeps? There are some modeling papers, e.g. Perhaps one of the scientists can say more. I have no clue myself, but I wouldn’t assume the answer is simple and straightforward, since the topography isn’t. The interaction is much discussed, anyhow, e.g. Bob (Sphaerica), it’s a bridge too far. Just one example, the shift from objective observations that might have some uncertainty into dogma with no allowed material uncertainty in the slightest, followed by the demon casting of anyone in the circle who so much as even raises an eyebrow is religious, not scientific. And that’s pretty much what your responses to John Peter look like. Frankly they could almost fit right in to many a tent revival meeting. BTW, I specifically do not call this a “religion” but rather religious sounding. Here’s a bit of a queer question, as the atmosphere continues to heat, could it get into a yo-yo style of trend? What I am thinking is that El Nino’s will probably become stronger, to release the built up energy, then of course, like a pendelum, the release will be more then needed, so the El Nina will be considerably colder. Which of course leads to a greater ability to absorb more energy, and so on and so on…..
What brought this to mind, is my apple tree, if I do not prune the apples as they are emerging, the tree gets into a yo-yo of one year abundant fruit, next year very little fruit.